In 1907 the Premier of Victoria Thomas Bent purchased Victoria the Golden from the artist William Strutt for £120 and presented it to the Victorian Parliamentary Library. Victoria the Golden is celebrated as one of the Parliament’s great treasures and we are excited to have it on display in Gold Rush: 20 Objects, 20 Stories. The son and grandson of artists, William Strutt (1825–1915) was born in Teignmouth, Devon. He studied in Paris in the atelier of Michel-Martin Drölling and at the prestigious École des Beaux Arts. On 5 July, at the age of 24, he arrived in Melbourne. Soon after his arrival he was employed by the Ham brothers to work as an illustrator for the Illustrated Australian Magazine. Strutt documented many facets of colonial life and its progress. He produced designs for the Arms of the City of Melbourne and the Colony of Victoria and also designed one of Victoria’s first postage stamps. Object courtesy Parliament of Victoria. The sketches and drawings contained in this album, are gathered together and arranged in consecutive order, as they were made by me. I can claim on their behalf, fidelity to nature’s accuracy; and therefor as records of what we may now look upon as the dim past, in the rapidly progressive history of Victoria. Victoria the Golden documents life in Victoria between 1850 and 1862. There are more than 100 illustrations in the album – and the range of subjects is comprehensive: parliamentarians, wives and daughters, merchants, labourers, police and military officers, indigenous communities, farmers, miners, prisoners and explorers. Significant events in the Colony’s history such as Separation Day (1 July 1851), the sitting of the first Legislative Council (13 November 1851), the death of Burke (June 1861) and the Black Thursday bushfires (6 February 1851) are depicted. Also included in the album are portraits of the newly-established Native Police Corps and illustrations depicting life on the Victorian goldfields. Strutt’s final works in the album are of the ill-fated Burke and Wills expedition. 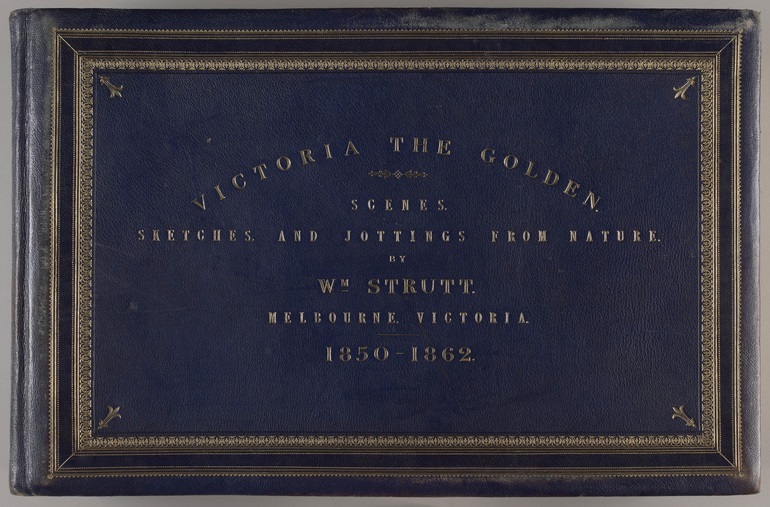 Strutt was among the last Melbournians to have contact with the expedition and over the course of his career created a large body of work on the subject. William Strutt, One of several sketches of Separation rejoicings and openings of Princes Bridge in Victoria the Golden: Scenes, sketches and jottings from nature, 1850-1862. Reproduced courtesy Victorian Parliamentary Library. 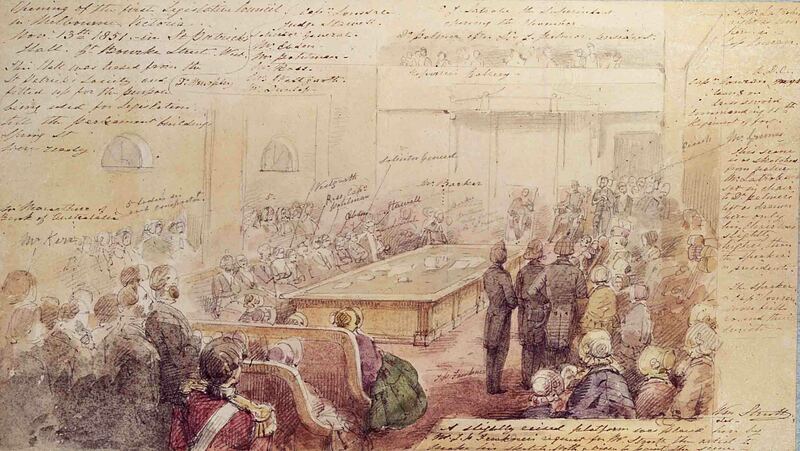 Strutt’s painting of the opening of the new, two-thirds elected, Legislative Council of Victoria on 13 November 1851. Victoria the Golden: Scenes, sketches and jottings from nature, 1850-1862. Reproduced courtesy Victorian Parliamentary Library. 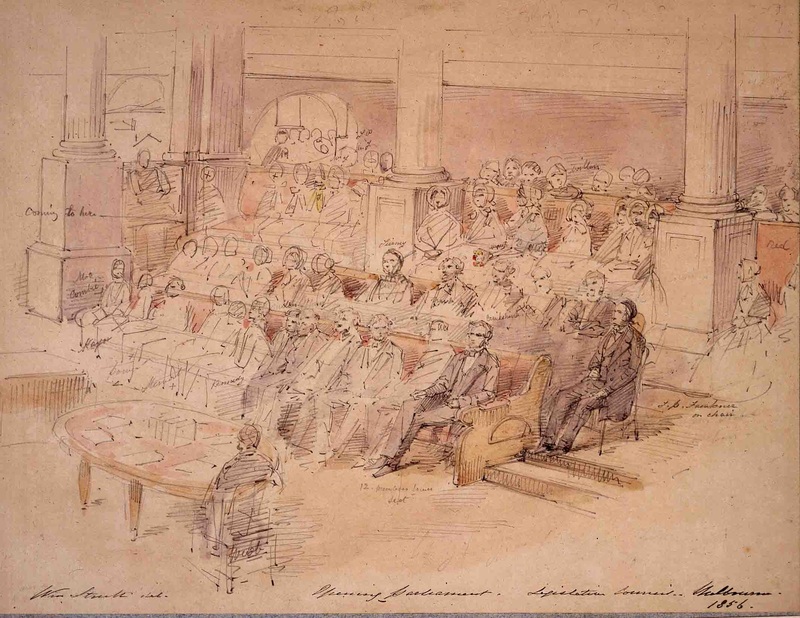 William Strutt's sketch of the opening of the first Parliament of Victoria under responsible government, on 25 November 1856. The Parliament comprised a fully elected Legislative Assembly as well as the Legislative Council. 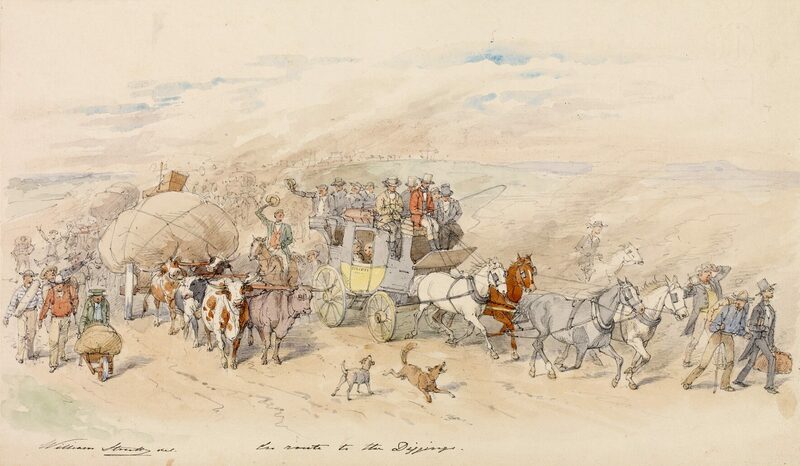 William Strutt paints a group of hopeful diggers on their way to Ballarat. Some are lucky enough to afford the coach, and have their luggage carried by cart, while others travel on foot. Here, indeed, was an extraordinary sight. A piece of ground about two or three acres in extent sloping down gently towards a moderate-sized creek was perfectly honeycombed with holes, some just beginning to be dug, but in most of them the diggers were deep down below getting out the auriferous soil, which others were hauling up in buckets to carry in barrows to the cradles, where this washing stuff, as it was called, was most thoroughly washed at the side of the creek by being rocked to and fro in the sieve, [and that] which falls through to be collected from the bottom of the cradle. The creek was lined as thick as it could be packed. Every claim holder had a right to a space in front of the running stream where his cradle stood ... The whole field of operations reminded one of a huge ant hill, just disturbed, with the distressed insects hurrying about hither and thither to set things in order once more. One of William Strutt’s earliest jobs (commissioned by the Ham Brothers) was to sketch and engrave the portraits of several members of the Native Police Corps. 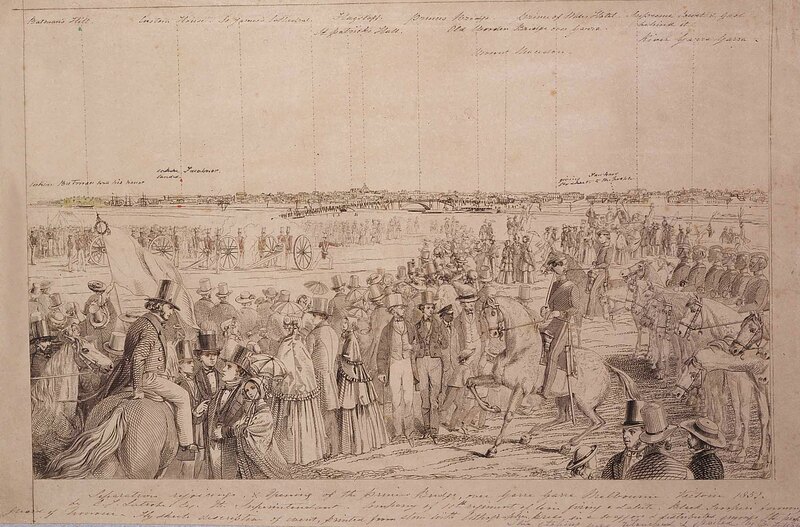 Strutt spent time at the Richmond police paddock in Melbourne sketching the men, their horses, uniforms and equipment. 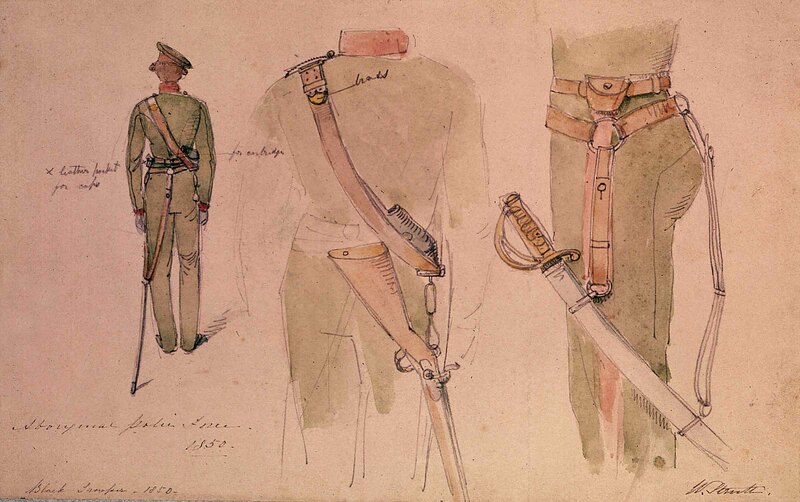 This pencil and watercolour sketch Aboriginal police force [uniforms] (1850) shows the Native troopers of Port Phillip in their winter uniform which was made from dark green woollen fabric, with a red stripe on the side of the pants, a jacket with red collar and cuffs made of the same woollen fabric, and a cap with a red stripe. Strutt’s drawings indicate that they also wore leather belts with brass buckles, leather cartouche boxes and carried quite a lot of equipment such as swords, short carbines and bayonets. 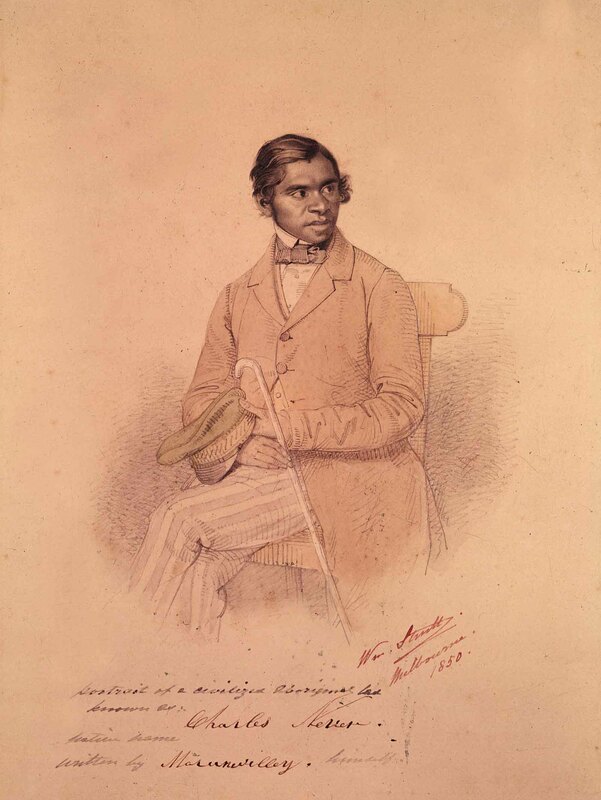 Here we see Charles Never Marunwilley, a native of the Lower Murray region that William Walsh, an officer of the Native Police, had brought to Melbourne as a young boy. Charles attended the Merri Creek school, which was administered by the Aboriginal Protectorate under Assistant Protector William Thomas. Between 1842 and 1844, the Native Police headquarters was located next to the school and so Charles often saw the troopers. It is said he admired their gentlemanly poise mounted on horseback in their dark uniforms. Charles apprenticed to a tailor in Elizabeth Street in Melbourne and once trained, was appointed tailor to the Native Police Corps. This image, Aboriginal Black Troopers, Melbourne Police with English Corporal (1851), is accompanied by the following text by Strutt: ‘Black troopers drilling. This valuable force, so useful as bush trackers, were disbanded at the discovery of gold. These men … were splendid horsemen’. It is clear from his depictions and additional notes that Strutt had great respect for the troopers and their capabilities. 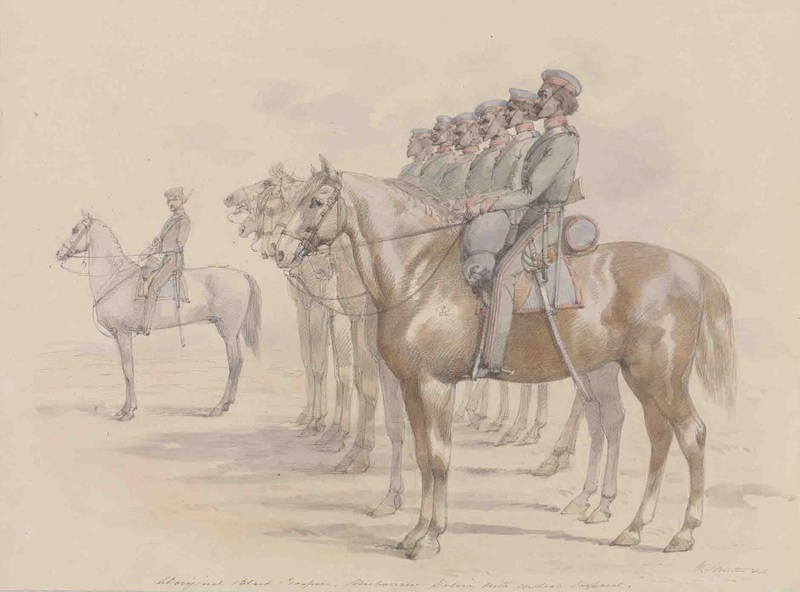 While visiting the Victorian goldfields, William Strutt made several drawings of the Native Police Corps. 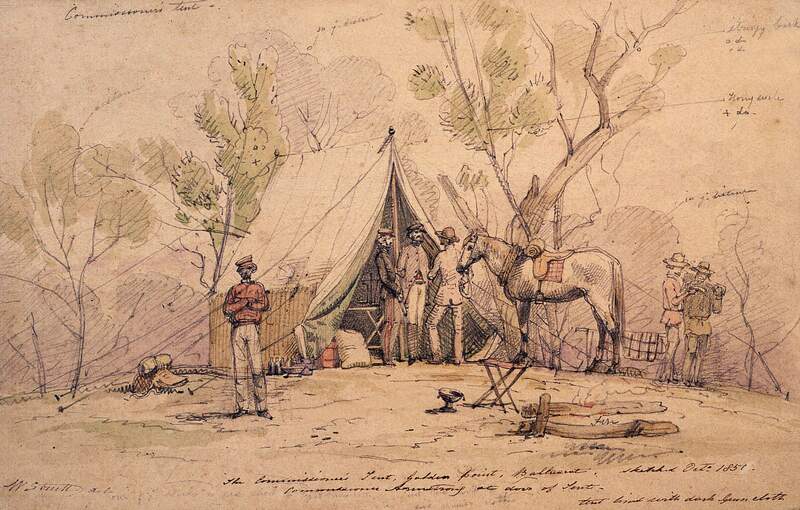 In this work Strutt shows the Commissioner’s Tent at Golden Point, Ballarat, where the Native Police Corps were headquartered. Strutt wrote, ‘these fine fellows were at first the only mounted police, and indeed performed all the police duty at the Ballarat Diggings’. An e-book version of Victoria the Golden is available for free download here (iOS device only).